Who is Frailty Myths and What we do? Frailty Myths’ exists to confront and dispel the myth that the feminine is frail. Our skill based workshops invite women, trans, and gender non-conforming folks to come and learn tangible skills while actively unlearning patriarchy. Through a powerful pedagogy and experiential learning practices, Frailty Myths challenges the notion that in order to be strong, capable, and confident, you have to sacrifice your femininity or assimilate into toxic masculinity. At Frailty Myths, we know better – our workshops in wordworking, sailing, climbing, welding and more – allow our participants the space to have a transformative experience that they walk away feeling empowered, accomplished, confident, and one step closer to smashing patriarchy. Frailty Myths is an organization that believes in the liberation of women as individuals and within the systemic structures that uphold patriarchy throughout our society, both institutionally and socially. We believe that the trajectory of feminism through the 1st, 2nd, 3rd (and beyond!) waves has shown us that diversity within feminism makes our movement for liberation and equality stronger. Because of this, we know that the inclusion of our trans, non-binary, and gender non-conforming community members is a key part of our work. We recognize that gender does not exist on a binary, that we should not assume gender expression, and that our workshops will allow participants to exist in a space without a self-identified male gaze. At Frailty Myths, we work to challenge the traditional pedagogy. Our teaching approach is at the intersection of Liberation Pedagogy and Feminist Pedagogy. The model of liberation pedagogy ignores the private sphere and treats liberation primarily in terms of public spheres of work and politics. It also ignores the intersectional way in which identities manifest in the public and private sphere. Out teaching model requires weaving perspectives and values rather than simply replacing one dominant view for another. Feminist pedagogical models also have weaknesses that we must address. Gender models often minimize the nature of oppression as a factor in women’s lives and experiences. Furthermore, gendered models of learning often essentialize the female perspective, and often in stereotypically patriarchal ways. These models embrace a hyper-feminized view of “womaness” that ostracizes cisgendered women that seek to engage with their physical and self reliant selves by relegating them to “Tom Boys,” while completely failing to consider the experience of trans and gender nonconforming folks. Both of these models have weakness that are addressed in Frailty Myths’ work. Frailty Myths’ pedagogy works at the intersection of Liberation and Feminist Pedagogy. Frailty Myths trusts in people and their creative power. We work to create a liberatory model of education that intersects these pedagogical systems to create a learning environment that is a part of the reclamation process of our space and our experiences. We believe that when you provide space for marginalized communities to share their stories, transformative work begins. Our primary goal is to create a learning system and space in which are participants feel safe, away from the male gaze, and with those that have faced similar experiences. While many of our workshop are built around a project, the curriculum itself is rooted in experiential, transformative learning as the main goal. As participants work through a skill, the facilitators are responsible for guiding the process of exploring the elements of internalized oppression or self doubt that are triggered during a workshop. The power of Frailty Myths’ approach to experiential learning comes from first collectively building a meaningful container of the environment we want to create together and then facilitating the space to acknowledge, address, and work through the manifestations of how these systems impact us as they arise throughout the skill learning. This is the moment where we can begin to truly unpack the ways, as individuals, we have absorbed, internalized, and even perpetuated the very forms of oppression we are against. At Frailty Myths workshops, you unpack as you build – you tear down old systems while actively participating in what a more just way feels like. Self Reliance is core to the mission of Frailty Myths. When we think about self reliance, it is first framed in understanding the complex system of institutionalized oppression and exploitation at the root of modern Capitalism. Frailty Myths’ work around Self Reliance allows participants to produce for themselves without their labor being commodified. Our curriculum provides tangible skills, experience, and other learnings that allow our participants to know what if feels like to become less dependent on systems that we are taught to believe we would fail without. When we start learning how to build our own shelters, build our own fires, grow our own food, we start unlinking the chains of capitalism. From a holistic perspective, we are working toward a future where our communities are no longer reliant on a system that depends upon their exploitation and disempowerment. We define Frailty Myths as a feminist organization because our work focuses on the construction of space, tactics, and resources to challenge the structure of patriarchy in our society. 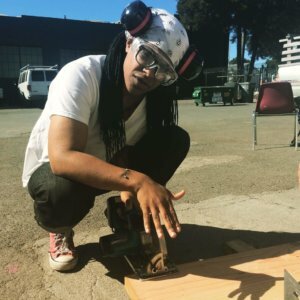 While our work focuses primarily on the ways in which we can empower those that do not identify as male to destroy these systems of inequality in their workplace, community, and home, we recognize the fundamental role that society in total has on patriarchy, both in its construction and eventual reconstruction. Our feminism is intersectional, meaning, as discussed further below, we believe that race, sexual identity, class, and other identities in our society affect the way in which patriarchy impacts our lives. We believe in bringing those different experiences into the light, as they strengthen our movement towards inclusion and equality. We define Frailty Myths as a nonprofit that embraces an intersectional framework. Frailty Myths uses the term intersectionality coined by Kimberlee Crenshaw; this theory centers the interconnected nature of social categorizations such as race, class, and gender as they are applied to an individual or group, regarded as creating overlapping and interdependent systems of discrimination and disadvantage. Our intersectional framework embraces the substantive difference in experience, physically and socially that people experience as related to these interconnected identities. We look to draw these experiences out from the often overlooked margins of our society to express the unique challenges that people with marginalized identities experience and how to combat this and upset systemic inequality. Specifically, at Frailty Myths, we believe in highlighting the challenges that Black women and women of color face against the constant pressure of a society offering policy and social solutions that require their identity of “women” or “black” and not both. Frailty Myths centers Queer Theory and Transfeminism in our theoretical framework. We are focused on decentering conceptions of gender, specifically as it relates to strength and leadership. We believe that gender is a socially created construct. Transfeminism for Frailty Myths is a movement by and for trans people who view their liberation to be intrinsically linked to the liberation of all women and beyond. It is also open to other queers, intersex people, trans men, and non-trans women and others who are sympathetic toward needs of trans women and consider their alliance with trans women to be essential to their own liberation. Transfeminism and Queer Theory embodies feminist coalition politics in which women from different backgrounds stand up for each other, because if we do not stand up for each other, nobody will. Frailty Myths believes that everyone has the right to define their own gender identities and for society to respect them. This includes the right to gender expression without fear for discrimination or violence. We also reject the gender binary system that often requires women to “prove” their femininity and intrinsic womaness through the performance of gender stereotypes or medical intervention. Transfeminism holds that no one shall be coerced into or out of personal decisions regarding her or his gender identity or expression in order to be a “real woman”. Frailty Myths Facilitators have an intersectional political/social analysis as framed in Frailty Myths‘ Philosophy and are comfortable discussing it. Frailty Myths Facilitators are comfortable discussing this analysis as a central focus throughout the container building and workshop. Frailty Myths Facilitators understand that the experiences of all participants are not the same and honor the differences. Often these conversations are emotional and complicated as Frailty Myths participants work through a myriad of learned and perceived experiences. Frailty Myths facilitators are prepared to push back and challenge concepts that do not center an intersectional analysis. Frailty Myths Workshops discuss the way in which gender is currently constructed through the lens of a binary, the way in which this limits and restricts who is included in space and society, and how we reject this binary throughout the Frailty Myths workshops. Frailty Myths’ community workshops are specifically for anyone who identifies as woman, trans, or gender non-conforming. We are committed to prioritizing people from marginalized communities who have the least access to these spaces and skills, specifically Black, Brown, and Indigenous people as well as folks who are differently-abled and those who have been excluded due to other forms of state-sanctioned violence. The mission of Frailty Myths to create a space for women, trans, and gender non-conforming folks to gain skills and resources that are not always accessible to us. Despite our goal of providing free skill-shares and outreaching to communities that are often marginalized, each workshop will inevitably fail to outreach to ALL groups. We are able to name who isn’t in the room. At Frailty Myths workshops, facilitators meet the participants where they are at in their journey. Each participant comes to our workshops with a wealth of experience and knowledge that must be respected. We fundamentally believe that in each workshop, instructors become students and students become instructors. The pace and structure of the workshops is determined by the needs and desires of the participants. As emotions and feelings are being processed by Frailty Myths participants, it is vital that Frailty Myths facilitators provide time and space to work through this. Unpacking the systems of patriarchy that often arise during the workshop is more important than, for example, finishing the project. This entry was posted in Gender, Myths, Race and tagged empowerment, feminism, frailty myths, gender, gender justice, intersectional feminism, intersectionality, liberation, self reliance, smash patriarchy, social construction. Bookmark the permalink.